The Six Banded Distichodus (Distichodus sexfasciatus) is found in Lake Tanganyika, Cameroon, Tanzania, and the Democratic Republic of Congo. Six Banded Distichodus (Distichodus sexfasciatus) are a fast moving benthic species that inhabits the lakes and rivers of their range and are often confused as juveniles with the much less common and smaller Long Nosed Distichodus (Distichodus Lusosso). Six Banded Distichodus are collected from lakes and larger rivers and in the wild can grow to a length of 30″ or more. Juveniles specimens are often found in large shoals, however as the grow into adulthood, they become increasingly aggressive towards conspecifics. 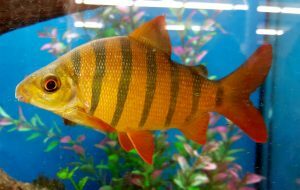 Like its longer nosed relative (Distichodus Lusosso), juvenile Six Banded Distichodus (Distichodus sexfasciatus) have attractively colored vertical orange and black stripes over their body and bright red tinged fins, but as they grow into adulthood, they gradually lose their “perch” like colors. Although the Six Banded Distichodus is generally a peaceful species, they are unpredictable in a community tank environment. Some specimens can be housed with similarly sized fish and remain peaceful, while others become aggressive. They should never be housed with shy or much smaller species. Good tank mates include bichirs, large characins, cyprinids, catfish and Loricariids. Juvenile Six Banded Distichodus are best housed in an aquarium of at least 100 gallon capacity with a sand or fine gravel substrate, some driftwood , smooth river rocks, and a few hardy plants like Bolbitis or Anubias spp. They are omnivorous and will graze on any planted soft vegetation growing in the tank. Six Banded Distichodus require good water quality and flow, therefore bi weekly 30 to 50% water changes and a good quality filtration system is necessary to keep them healthy. They are also excellent jumpers and require a tightly fitting cover over their tank. Although 5 or 6 juvenile specimens will shoal together peacefully in an aquarium environment, an enormous tank must be provided to keep them as a group of adults, as they will become increasingly aggressive and hostile towards one another. The Six Banded Distichodus is not known to have been bred in captivity. Six Banded Distichodus will accept most omnivore flake foods offered to them however, they also need vegetable matter to keep them in good condition. In addition to a diet of live and frozen prawn, mussel, earthworms, etc., they need frequent offerings of blanched spinach, shelled frozen peas, cucumber, and Spirulina flakes in their diet to maintain their health. The Six Banded Distichodus is the most common of the few Distichodus species acquired by tropical fish keeping enthusiasts. They are almost always sold as juveniles but sadly, because of their temperament and large size they are not suitable for community tanks. 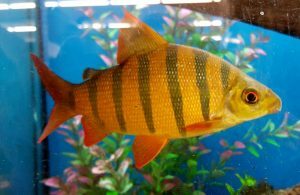 Distichodus sexfasciatus are occasionally available online from importers or from specialty tropical fish keeping shops when they are a couple of inches long, but this is one species you should not purchase unless you have the tank size and available space to house them for life. Juveniles and adults are rarely seen for sale. I’m wolfman: this is a nice fish I was hoping it would be more than moderately aggressive I wanted it to be aggressive to see how tiger barb fish go with it.